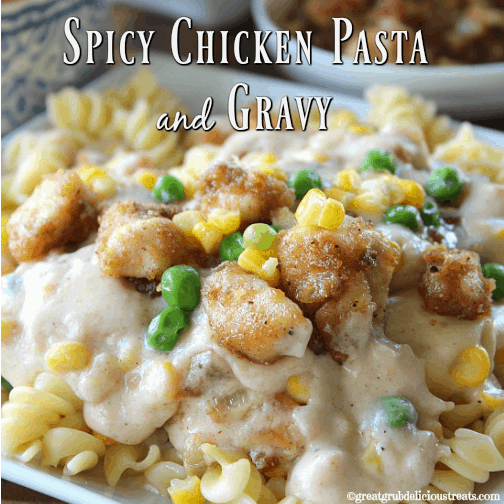 Spicy chicken pasta and gravy is what’s for dinner. I had some chicken sitting in the fridge that needed to be cooked and decided I wanted some fried chicken and then one thing led to another and presto, spicy chicken, pasta and gravy! Doesn’t this just look so comforting? 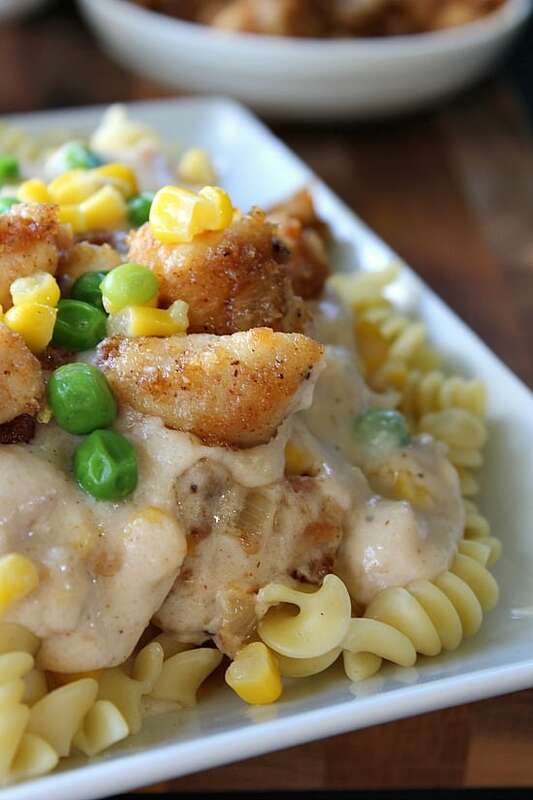 Fried spicy chicken bites, chicken gravy, throw in a few veggies, all on top of rotini pasta…. Yum! Delicious and super spicy is how I would describe this meal. Cayenne pepper adds a bit of a kick to the chicken and the spiciness was perfect but you can totally omit the cayenne pepper if you do not like spicy food. 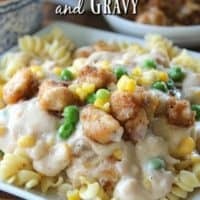 Yum, this ended up being a huge hit, with the creamy gravy, along with the spicy chicken bites, and pasta to boot! 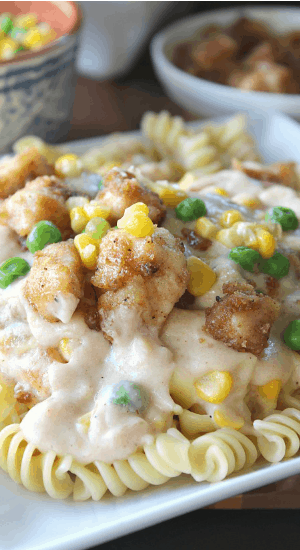 Who doesn’t love a good pasta meal?! Let me know how you enjoyed this meal. 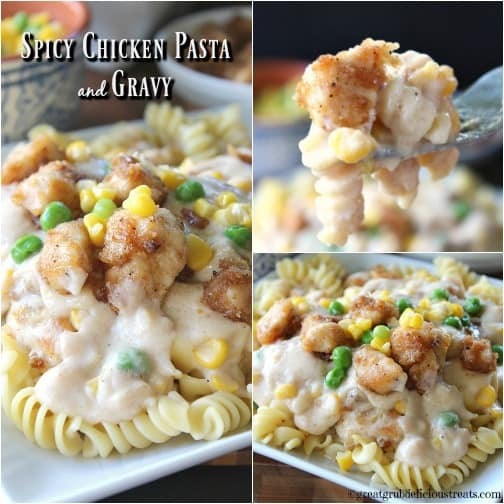 We loved it and I will definitely be making this spicy chicken pasta and gravy again soon! In a large frying pan, heat 1/2 cup oil over low/medium heat. In a large baggie, add flour, taco seasoning, cayenne pepper, garlic salt and pepper. Zip closed and shake well. Remove 1/4 cup flour mixture and set aside. Add chicken and shake until all pieces are well coated. Remove chicken pieces from baggie, add to frying pan and add onions after about 5 minutes. Cook approximately 10-15 minutes, stirring frequently. Once cooked, take 3/4 of the chicken from pan and set aside. 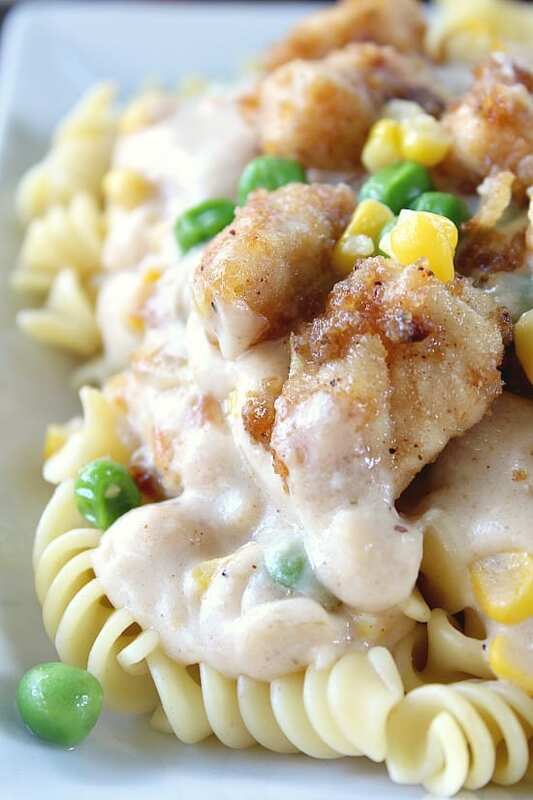 Melt butter in pan with remaining chicken pieces. Sprinkle saved flour mixture over chicken and stir. Let cook for a few minutes. Pour milk into frying pan and stir until gravy cooks to desired thickness. While the chicken is frying, heat water in a large sauce pan and cook pasta according to package directions. In a small sauce pan, heat corn and peas over low heat. Drain. 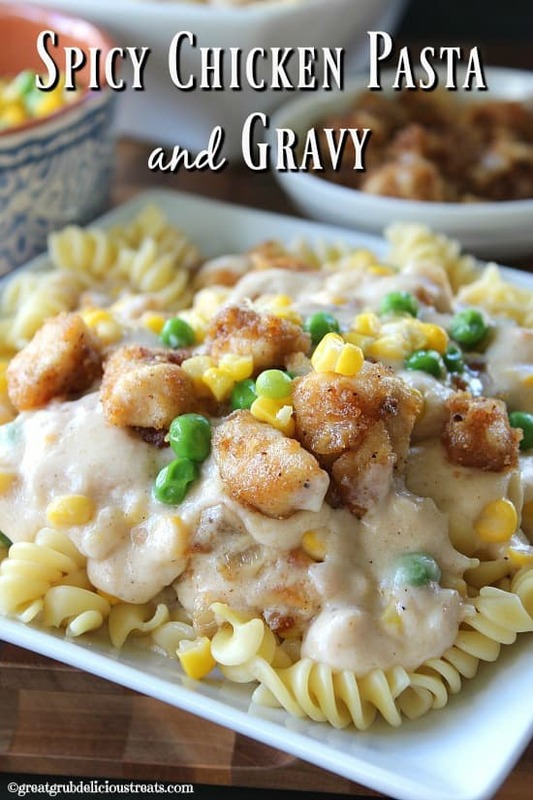 Once gravy thickens up, add veggies to gravy. 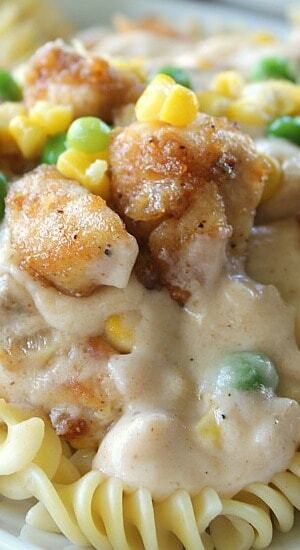 Layer pasta, then gravy and then top with remaining chicken pieces. 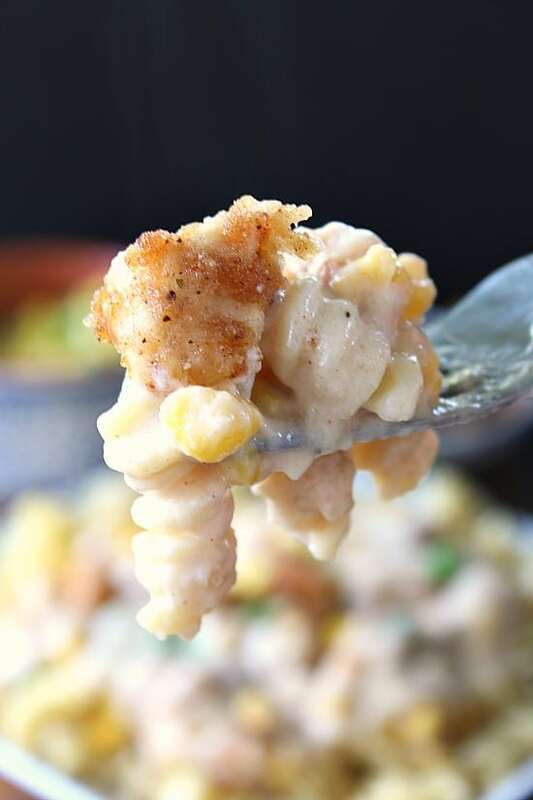 Here are a couple of pics that are the perfect size for pinning to Pinterest.